American casinos online love rewarding high-roller players with some really great exclusive bonus deals. It’s in the best interest of casino sites to keep players who spend good amounts of money on their site on a regular basis. This is why most sites have VIP bonus deals or programs. These rewards gift high rollers with wonderful as well as lucrative gifts that make players want to keep coming back to a particular casino. As some online gamblers may be curious about VIP bonuses, we have detailed all there is to know about these great deals below. As already mentioned, VIP bonuses are built with the aim of rewarding loyal high-rollers. They are a very specific type of loyalty bonus. These bonuses offer more than simple bonus cash and free spins rewards, with some bonus schemes and programs rewarding players with real-life gifts. Often, American casinos make use of VIP loyalty reward programs that have several tiers. The more players spend at the casino, the higher their level and the more lucrative the rewards. Well, this is really dependent on the person. Some players may feel that the bonuses and rewards are worth it whereas others might not. It is important to note though that you will need to keep spending money at the casino to retain your status. This is because casinos consistently re-evaluate the status of their VIP players. Most VIP players aren’t spending money to become part of the rewards program though. They do it for the love of the game and the bonuses are simply just extras in the experience. We don’t ever recommend just spending cash at casinos just for the sake of getting casino bonuses for VIP players. 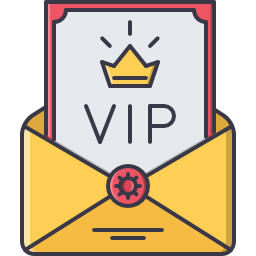 As previously stated, many VIP bonus programs work with a tier system. This means the more you spend, the higher your tier-level. Higher tier-levels get better rewards. In order to become a VIP player, you just need to spend a lot of money at your preferred VIP casino. Most casino sites we feature require players to make deposits of around $10 000 or more. (However, this figure does vary from site to site.) Players also need to make big deposits consistently to retain their status. We weren’t lying when we said you would need to spend a lot of money. When you have met the requirements for the VIP program, you will be invited to join by the casino. However, if you can’t afford to become a VIP player, don’t blow your bankroll just to become one. The whole point of online gambling is to enjoy yourself, whether you’re a low roller or high roller.